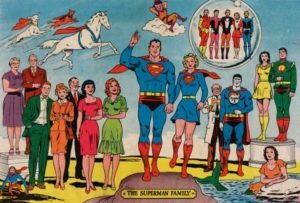 If you were around in the 1960s, then you would have had an opportunity on either side of the Atlantic to read DC Comics. In the UK, they even had their own roundabout stand exclusive to themselves and a rival company called Marvel Comics. 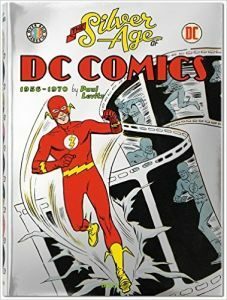 Although not stated in this book, ‘The Silver Age Of DC Comics: 1956-1970’ by Paul Levitz, it was always implied at the time that if you read one company, you didn’t read the other, so after starting to grow out of British comics and only reading TV21 and discovering that the American comics kept for rainy days school break-times, I started on them. Perhaps not at the dawn of the Silver Age, but a selection was in my reading habit. It was amazing how many ‘Jimmy Olsen’s and ‘Lois Lane’s there were in the school cupboard compared to the rest. The introduction to this second volume is an interview with artist Neal Adams and how he began to work for National Periodicals, seeing it initially as a job stepping stone and then falling in love with the medium itself. His output initially was more for the ‘House Of Mystery’ and war comics long before he did the likes of Batman and Green Lantern but could turn his hand to anything as you see from a cover for the ‘Bob Hope’ comic. Adams also hold the distinction of being the first artist to write on a series that they hadn’t created since the Silver Age and that was the second Spectre story. With the success of a revived Flash by Julius Schwartz, many of the original Silver Age characters had similar changes. Superman in all his comics always sold and its interesting to note that at that time, the ‘Lois Lane’ comic actually outsold the ‘Batman’ comic. Interestingly, the TV series boosted its sales and then had to have a revamp a couple years later to put him back on track. With the advent of the Justice League Of America team, both the Martian Manhunter and Aquaman featured on the cover for the first time in its start on ‘The Brave And The Bold’. When the switch from text to pictures is done after 48 pages, Paul Levitz does think that the Martian Manhunter predates the new Flash as the first of the Silver Age DC super-heroes so don’t be caught out in any comicbook pop quizzes. An often repeated theme in this book is showing the Golden Age and Silver Age super-heroes doing their cross-over jaunts. Hardly surprising when you consider how popular they were with the fans and singularly unique to the DC Universe. When I read them when young, I hardly knew of the earlier versions and tended to treat them as the more the merrier. Oddly, I tended to miss out on the cover gorilla issues but as editor Julius Schwartz pointed out, the sales always jumped higher so maybe they sold out before I saw most of them. Themes across the titles happened a lot as you’ll find out reading this book. Looking at Superman’s Fortress of Solitude as depicted here, I know it was pretty difficult for anyone but Kryptonians to get into because of the weight and size of the key but there were so many rooms revealing various secret identities, it could well have been classified as a security risk. More so when you look at the giant keyhole as someone could literally walk through that keyhole. Something rather unique to this book is seeing Curt Swan’s face guide to Superman showing some 25 expressions. A lovely twist further in is showing under the face mask that Superman is actually Alfred E. Newman but that’s really mad, isn’t it? Ramona Fradon still holds the record to this day for unbroken tenure drawing Aquaman. When it comes to the Legion Of Super-Heroes, there is a rare page of Jim Shooter’s original illustrated script as he didn’t know the scripting protocols at the time. I wish they’d put it next to the final Sheldon Moldoff art because he drew pretty faithful to it, giving a little extra space in the panels. As odd flaw that I wish Levitz had picked up on is showing Shrinking Violet attempting to implant a minute piece of kryptonite in Superboy’s brain to remove his memories of the Legion but having the page order the wrong way around. 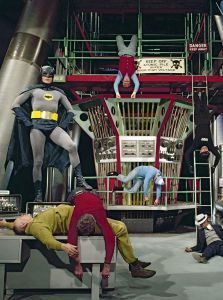 As with the previous volume, there is a closer look at the work of Wallace/Wally Wood and Joe Kubert before moving onto the transition of Batman into the 1966 TV series and a lot of stills I haven’t seen before. Incidentally, did you know their Batmobile weighed 3 tons! No wonder it needed turbos to move. There is also the Patent Office plans for George Barris’ design for the Batmobile. Steve Ditko also gets his own section with a look at the Creeper, Question and Blue Beetle. Neal Adams section is a little smaller but considering the number of covers shown that he worked on, that’s understandable. The book also features Detective # 347, one of the earliest DC Comics I picked up, unknowingly not knowing it was an imaginary story until I started reading Gardner Fox’s prose. Ah, memories. Considering how few issues ‘The Inferior 5’ had, I was surprised at how many pages it was given but considering that DC Comics rarely parodied their own material, I suspect it was used as a means to show newcomers that and also their creators doing it to themselves as well as a response to the Marvel version. ‘Doom Patrol’ also gets some decent exposure and a blueprint of Automation…er…before he became Robotman’s…mechanics. When it comes to Superman, he had his short-run musical and a display of food ads, the promotional displays of which being very valuable these days. Lest you think this book only covers super-heroes, we also see DC’s output for the modern culture, at least for that time period and the seek for new talent to accommodate it, and that of romance, where John Romita Sr. worked for 8 years. They only offered him ‘Metamorpho’ before he jumped to the opposition. Their war comics, especially Sgt. Rock and his Easy Company in ‘Army At War’ gets some decent exposure, too. The look at Wonder Woman is interesting because this is the first time I’ve seen a picture of her in a long time as Diana Prince where, like Superman as Clark Kent, in profile gives the idea of their dual identities. There’s also some theme issues where the girls either fight amongst themselves or kick the men, the covers shown for these all had Neal Adams involved. Should we even talk about imaginary marriages? Levitz also points out that the Legion Of Super-Heroes of the time has 15 males to 9 females in their team. Another popular trend across the titles is the number of times super-heroes throw down their costumes and the Superman/Boy of the period does it several times. As you might tell from my enthusiasm, this has been a great book to read and stirred up a lot of good memories for me of the 1960s and added to my knowledge of the time period. If you’re of a particular age, then you will want to add this book to your collection and suitably chain it up so your ‘friends’ don’t want to ‘borrow’ it. If you’re younger, then reading this book will enlarge your knowledge.